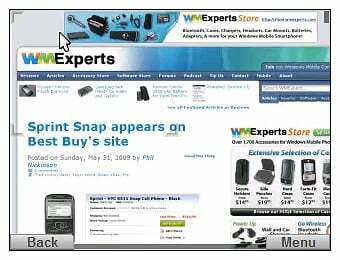 With the Epix released late last year and the Propel Pro earlier this year, some might have believed that Samsung had wrapped things up for a while with Windows Mobile. The Samsung Jack, the heir apparent to the BlackJack series, came out of left field for some and the time it took to go from announcement to appearing on the shelves was lightning-fast (shame HTC can't follow suit). We're not complaining, but it definitely took us by surprise. Dieter introduced you to Jack a few weeks ago and shared a hands-on video of Jack. You've seen it compared to other Windows Mobile phones, and recently we had the chance to take the Jack out for a test drive. 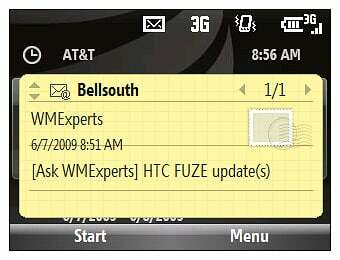 The latest Windows Mobile 6.1 Standard phone did impress us in several ways. Join us after the break. The first impression you get when you first take the Jack out of the box is how light this phone is. 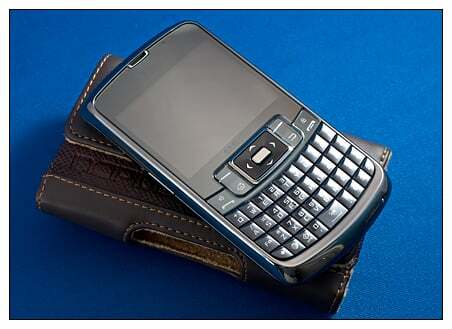 Weighing only 3.6 ounces, the Jack actually is .08 ounces heavier than the Samsung BlackJack II. What masks the added weight is the smaller form factor and curved edges and corners. Blindfolded, it would be difficult to tell the Jack from the Blackberry Curve. Jack did have a plastic feel to it, but not in a bad way. Jack didn't feel like a "toy" phone but instead a solidly constructed device that felt good in the hand. The Jack is packaged with the customary (and proprietary — grrrrrrr) charger, USB cable, software CD, owner's manual and headphone adapter. As Dieter pointed out in his hands-on video, the Jack doesn't come packaged with a headset, which really is no big loss. I would have liked to have seen (as would most) a 3.5mm jack on the Jack, but we can say that far too many phones. 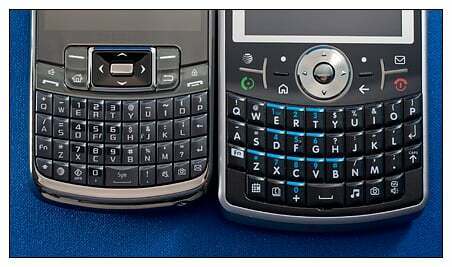 The front-facing QWERTY keyboard on the Jack is patterned very similar to the Motorola Q9h, but it's smaller. It lacks the spacing of the BlackJack II's keyboard, but it does have similar hotkeys for e-mail, camera, GPS and Web browsing applications. There's also ringer mute key. Typing on the Jack's keyboard was nice, but the smaller size did take some time to get used to. Just below the screen and above the keyboard is the Jack's center control panel. Here you'll find the answer/end buttons, two soft keys for on-screen menus/functions, a home and back button and a five-way control pad. Samsung calls the pad a "turbo" pad in that if you press and hold one of the directional arrows, the scroll speed accelerates. Some of the center buttons pull double duty. Pressing and holding the answer button mutes a call; pressing and holding the home button pulls up the Task Manager. Tapping the end button brings you the Home Screen and pressing and holding the end button locks the phone. On the left side of the Jack you have your power button and volume keys. Both buttons are flush with the sides of the phone. While it makes for clean edges, these two buttons aren't the easiest to manipulate. If you have a free hand, they work great. But they need to be a little more distinguished (e.g. slightly raised) to be more suited to one-handed operation. These two keys may very well be the weakest point of the Jack. On right side of the Jack you have Samsung's proprietary charging/sync/headphone port. (Again, grrrrrrrrr.) To the rear you'll find a 3.2-megapixel camera and speaker. 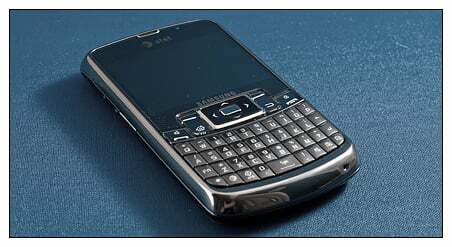 The Jack sports a speedy 528MHz processor and 256MB RAM/256 ROM memory. 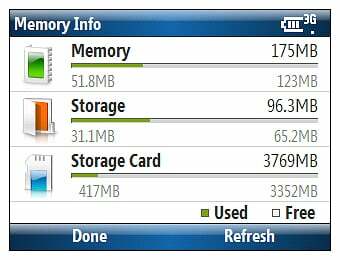 There is an expansion port for microSD cards. 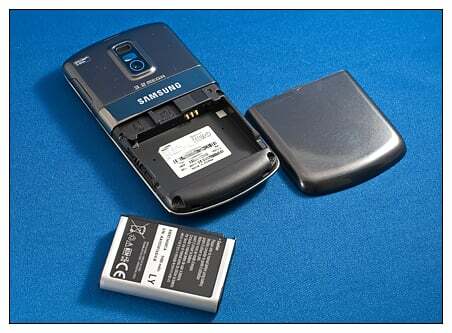 But, unfortunately, it requires removing both the battery cover and battery to access it. Speaking of the battery, the Jack is powered by a 1480mAh battery with a reported lifespan of approximately 7 hours' talk-time and 12 days of standby time. I was able to use the Jack heavily during the day (setting up e-mail, running GPS, installing apps, browsing the internet, etc.) with plenty of juice left over (about 50 percent) which which to head into the next day. The Jack is fitted with Bluetooth, WiFi and GPS. With Google Maps, I was very pleased with the GPS performance. 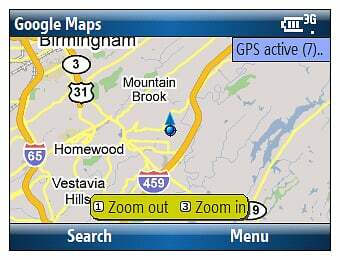 It does have assisted-GPS (aka aGPS) which will get you in the neighborhood of your location. In activating the GPS receiver, from a cold start, I pinpointed my location in less than a minute. 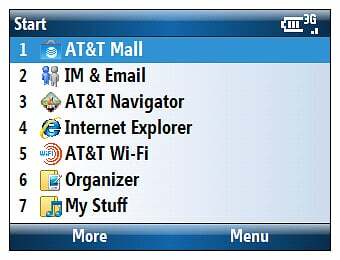 The Jack is loaded with Windows Mobile 6.1 Standard and the customary AT&T bloatware (going to through in another "grrrrrrrr" here) such as AT&T Mall, Navigator, MediaNet and that pesky ExpressMail download. 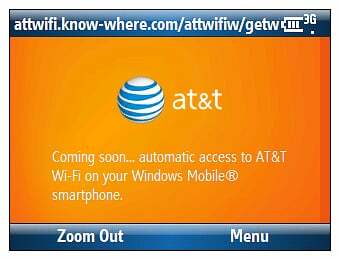 You also have a AT&T WiFi Locator that is supposed to help you locate hotspots, but it's not active yet. 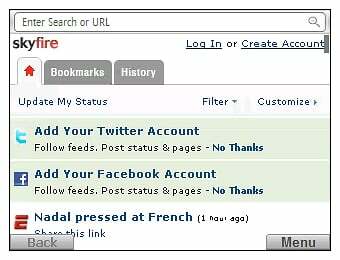 The Jack's preloaded with Pocket Internet Explorer that launches you into AT&T's MediaNet home page. You can remedy this fairly easy by changing the home page in the Options Menu but as an alternative to PIE I took the opportunity to install Skyfire 1.0 and made it my default browser. I was really surprised how well it operated on a Windows Mobile Standard phone and it actually performed better on the Jack than it has on the touchscreen AT&T Fuze. Page load times were noticeably faster that Explorer and I didn't see hide nor hair of MediaNet. 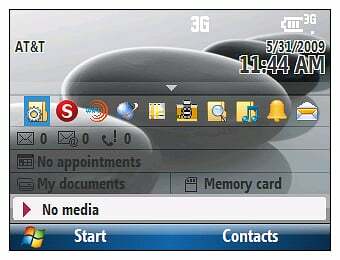 Home screen options include the Windows Mobile 6.1 sliders, traditional view, and a few Samsung designed screens (Pop-up and Dual Clock). 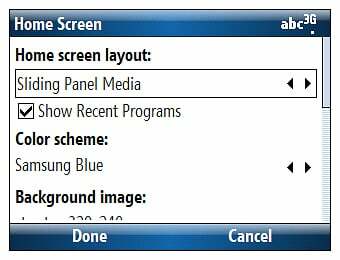 You still have the option of changing the color scheme and background image as well. The Start Menu pulls up your program listings, seven applications at a time. To scroll through them you have to go page to page or use the directional keys to scroll through them. In the Home Screen settings menu you have the option to check "Show Recent Programs." Out of the box, this option is turned off (which seemed odd) so don't panic if you don't see your recently used programs when you first hit Start. I like this option because it often eliminates the need to sift through four pages of applications to find the one your looking for. One new feature on the Jack is the Message Ticker. 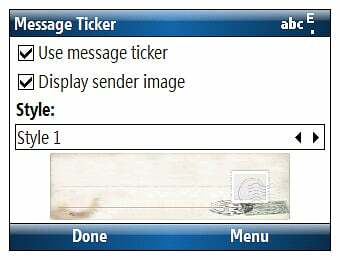 When active, a pop-up ticker appears on your screen when new mail arrives, giving a snapshot of information. It felt like the pop-up bubble that appears on Microsoft Outlook or Windows e-mail when new mail arrives — but more annoying. There are a few settings for the keyboard that I haven't seen on Windows Mobile Standard before. 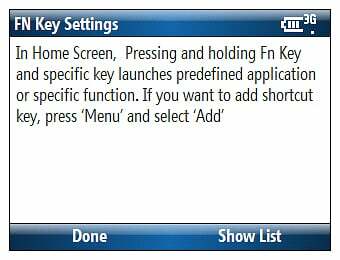 FN Key Settings gives you the ability to map a specific key to launch a predefined application of function when pressed in conjunction with the FN key. 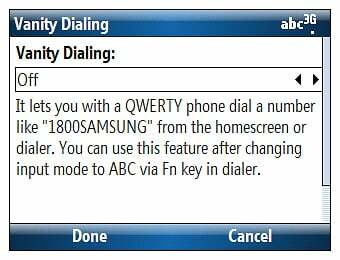 Vanity dialing, reading directly from the option screen, lets your QWERTY phone dial a number like "1800SAMSUNG" from the home screen or dialer. You can use this feature after changing input mode to ABC via the FN key in the dialer. This feature simply saves you a little time in dialing the vanity numbers without the need to interpret how the letter corresponds to the dial pad. For example: Instead of dialing 1-800-356-9377, you can type out 1-800-Flowers. 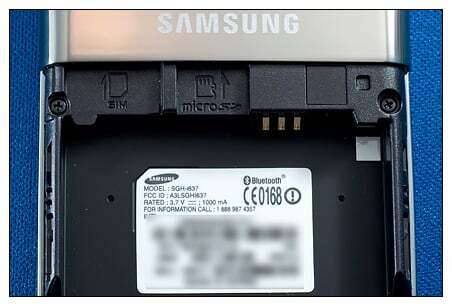 One last note with regards to the software: In the news release announcing the Samsung Jack, Samsung mentioned it would be upgraded to Windows Mobile 6.5. We know that Windows Mobile 6.5 can handle non-touchscreen phones, but Microsoft hasn't made any official announcements yet. It may simply be an indication that the specifications of the Jack make it suitable for upgrade if and when that ever happens. Again, the Samsung Jack feels really good in the hand. The curved edges and corners coupled with the light weight is just down right comfortable. The Smartphone Experts Side Pouch that I used while testing the Jack seemed to weigh more than the phone. Call quality was good, about par (maybe slightly above par) for any other phone these days, and reception was equally as good. Where my AT&T Fuze had two bars, the Jack would have two to three bars. The front-facing keyboard is suited for one-handed operation. And with the exception of the power and volume buttons, the Jack is easily handled one-handed. 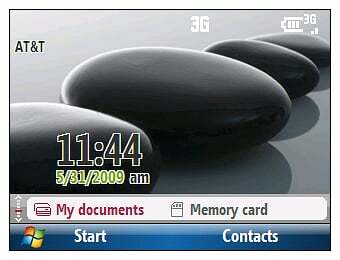 Windows Mobile Standard is a very capable operating system. And while I did catch myself tapping the screen from time to time, navigating around the Jack was a breeze. The more I used the Samsung Jack, the more I like it. Build quality was good and the phone feels comfortable in the hand. The only design nit I would pick with the Jack is that the volume keys and power button needs to be easier to access and manipulate. 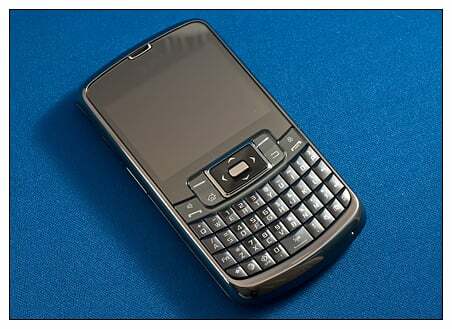 The keyboard is smaller than similar phones such as the Samsung Blackjack II and Motorola Q9h. But then again, the Jack is a smaller phone. It did take some time to get used to the smaller keyboard, and I found it more receptive to fingertips than thumbs. GPS, Bluetooth, and WiFi all are nice features to have on a phone, and the GPS receiver worked like a champ. I'm not a big fan of pulling up Media Net as your browser, but that was easily fixed by making Skyfire my default browser. The Jack's biggest competition will likely come from the HTC Snap. The Snap (from what we know) should be a larger phone, which may give the Jack a slight edge with some Windows Mobile users. Additionally, the Jack will likely be priced under the Snap. Currently, the Jack costs $350 out of contract and $99 after rebates and a two-year contract. No word yet on the Snap's pricing but early over-seas pricing has it in the neighborhood of $500. All in all, if you're looking to move to Windows Mobile Standard or replace that worn out Motorola Q or Samsung Blackjack, the Samsung Jack is worth serious consideration.